The Eco Cousins is a simple story that we have produced to help young children learn and understand about global warming. 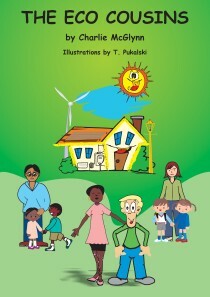 The story gives useful tips and encourages children to think of their own ideas for saving energy around the home. The Eco Cousins are Mary and Jack Eco, and they live in a village called Greenchester. Mary has her own building company that builds Eco homes. Her husband Patrick owns Greenchester Post Office, and makes sure that all the letters and parcels get delivered on time. Their son Barack would like to be a politician when he groes up and help to solve world problems. Their daughter Millie loves animals, has a pony called Mickey and would like to be a vet when she grows up. Mary's family have a kitten called Cheryl and a rabbit called Simon. Their favourite football team is Greenchester United, favourite TV programme is The X Factor, and their favourite band is Eco And The Sunnymen. Jack is a plumber and now installs renewable energy installations. His wife Madge is a professional musician with the famous band Eco And The Sunnymen. Daughter Annie is very bossy and wants to be a school teacher when she grows up. Their son Wayne wants to play for Greenchester United when he grows up. Jack's family have have a dog called Del and a hamster called Rodney. Their favourite football team is also Greenchester United, favourite TV programme is The Simpsons, and their favourite band is, of course, Eco And The Sunnymen. The Eco Cousins are all planning a trip to see their other cousins in China; they are working with their friends at Ashmead School in Aylesbury who are helping them plan the most eco-friendly way to make the journey. The Eco Cousins are available to visit local schools to help teach children about energy saving. See how they got on during some recent educational school visits.